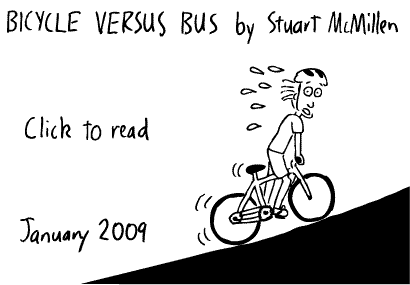 21 Comments on "Bicycle versus Bus"
Well constructed as usual Stuart. Your technical data as well as your artwork are first rate. We enjoyed your work and developing fitness. You will soon be as fit as us!! Sweet drawings man! You’re getting pretty good at buildings.. I sense a career move to architecture! Nice theme Stu – loving the green awareness thing you got going on… You McMillen boys are very net savvy! Great toons sir, dynamic stroytelling and bold linework leavened with a slice of science and a pinch of humour. Great. Note these observations were taken during school holidays. Bus trip times during the school and uni semesters nearly double in my experience from Morningside, making riding even more attractive. That’s true Mark. Also note that I tend not to ride the bus between the peak times of 7:30 and 8:30. It’s always earlier or later than the peak traffic on Coronation Drive. This site is interesting as well as informative. Enjoyed browsing through the site. Keep up the good work. Greetings..
How do these times compare to driving your own car? For me, cycling to work does take more time than taking the metro (50-55 mins vs. about 40 mins one way) and the train for me, but I still choose to do it a few times a week. But then, my bike is also far from optimal, and it depends hugely on what kind of an environment you’re riding in. Parts of my bike ride are a bit hilly and include lots of traffic lights which probably cost me 5-10 extra mins each way. Rush hours don’t really slow down things on rails that much so it’s pretty much all the same for me which time I commute in. Essentially, I think the choice comes to what you happen to like most. That the time spent showering is partially offset by the fact that you’d do it anyway is an important find, but that may also apply to other aspects. Do you like to spend your free time outdoors walking or exercising? Well, you just doubled your efficiency by both commuting *and* exercising at the same time! What a bargain! it takes just a little bit of time to go to the shower room at work, so I wouldn’t even imagine really going through the whole thing in just ten minutes. (On the other hand, I have long hair which also counts.) I don’t think the few minutes matter so much to me but if the difference between the two contestants is a matter of minutes, the few minutes scattered here and there also count. Also, I don’t really think I’d save that much money by cycling. I have an unlimited travel card for the local traffic anyway, and it’s not so expensive that I wouldn’t have it in any case just for the convenience. I might save a little bit by taking a cheaper unlimited card just for internal city traffic rather than a regional one (I commute to a neighbouring city where I’d otherwise have very little business), though. So, unless there are some huge differences, the biggest difference comes from how things offset each other, or whether they do. Other than that, it’s probably just preference. I think the comparison is skewed a bit because the main relative figures should be bike transit compared to private car.Similarly the route isn’t mentioned, and I’d assume that the riverside bikeway could have been used when no similar dedicated track exists for other bike access routes to the CBD. The other comparable could be the ability to read or listen to audio while on public transport (assuming a seat was available) compared to bike travel. To ride to the CBD along Sandgate Rd or via the Bruce Hwy — although plenty do it — is a mortal challenge on a morning, and for a feasible option we need dedicated bikeways not white lines painted along a road ab hoc. Similarly, cheaper fares — or no fares! — will change the equation greatly. Did you factor in the delay you created for other people who were stuck behind you when you were cycling on the road sections? Thanks Stuart. Interesting and chimes with my own experience in rainy and cold northern England. Tony: we cyclists cause little congestion, no pollution and use health care facilities a lot less. We are part of the solution – not part of the problem. Good stuff, stuart. How is the heat for cycling in Brisbane? i recently got a contract in Townesville – my attempts (2) at cycle commuting completely defeated by heat – was only September. My experience riding to work in Sydney was terrifying. From my home to my work, there is a double lane “road” filled to capacity with heavy transport and aggressive drivers. Drivers ignored my status as a legal road user and swerved closely past me, sometimes abusively. The actual space I was eventually allocated on the road was much smaller than my comfort level. To summarise, on the upside, I felt fitter, environmentally friendly and had a sense of achievement. ON the downside, I was a mess when I arrived at work with no time to shower, had helmet hair ( I am a girl – not good), was terrified all the way to work and doubly so in peak hour traffic on my way home, my thighs hurt a lot and I I suspect they became larger, and I struggled n each and every hill. My travel time was slightly longer than had I sat in the parking lot that is Sydney peak hour. My conclusion? Thinking I should move form Sydney and ride more…. @Tony — did you miss the part where he states that the road was wide, presumably wide enough to accomodate cars AND bikes? I haven’t gone as deep with my stats as you have, but my savings are roughly double that of yours (annually). My daily commute is 7 KM, works out roughly to 1500 KM (annually). It takes longer to take the bus to work, due to a huge detour. The cons are basically the same as 4Grrl mentioned. Aggressive drivers that do not respect your rights as a legal road user, even when you follow all biking rules. I’ll keep on biking because I enjoy it and the pros outweigh the cons. However, once Winter comes along I’ll have to start taking the bus. © 2010 All rights reserved. Designed by The Wedding Photographer.